Summer is nearly over so it’s time to share your favourite memories! 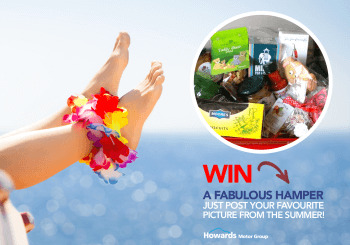 To enter our competition, all you have to do is simply share your favourite photo from the summer in a comment on one of our Facebook competition posts before the 20th of September. All entries will be submitted into our Summer Competition Album, where we will kindly ask the people of Facebook to vote for their favourite photo, so be sure to send us an excellent photo for the best chance of winning a luxury hamper perfect for any family! 1 x bottle of Secret Valley red wine. FYI - Some of the items inside this hamper may contain nuts, gluten, soya and lactose. Don’t forget to like our Howards Group Facebook page! You can enter our Facebook competition through clicking here. All entries must be posted to the Howards facebook page. You can enter by posting your photo as a comment on the Facebook post. Only entries on the 20th of September or before will be accepted. The deadline for submitting all votes is 30th of September. To vote for your favourite photo, simply like or write a comment on the image. Any images entered into the competition must be your own and you can only have 1 entry. Ensure those pictured in the photos have given you permission to use the photo. Winner will be announced on October 1st at 12pm.